All prepayable taxes and surcharges including departure tax. 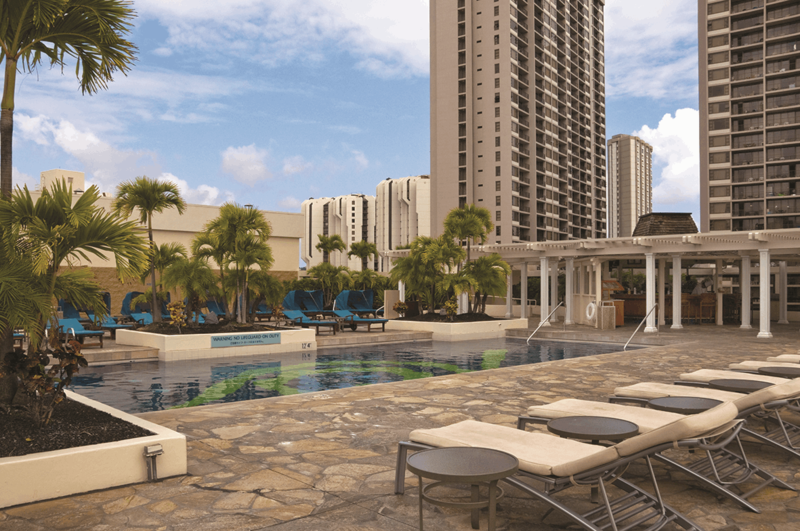 Aqua Aloha Surf is situated in a quiet location close to the Ala Wai Canal, yet is still just a short stroll to Waikiki Beach as well as the International Marketplace with its variety of shopping and dining. The hotel's welcoming open air lobby is connected to a relaxing pool area with cabanas and barbeque grills which is lit by tiki torches at night. Save 10% on your hotel stay, (discount already included in the price). Conditions apply. NOTE: From price based on a Superior Room with Lanai, Promotional rate, for travel on selected dates between 12-23 May &amp; 14-26 Jun 19 . Hotel pricing is dynamic and is subject to availability. 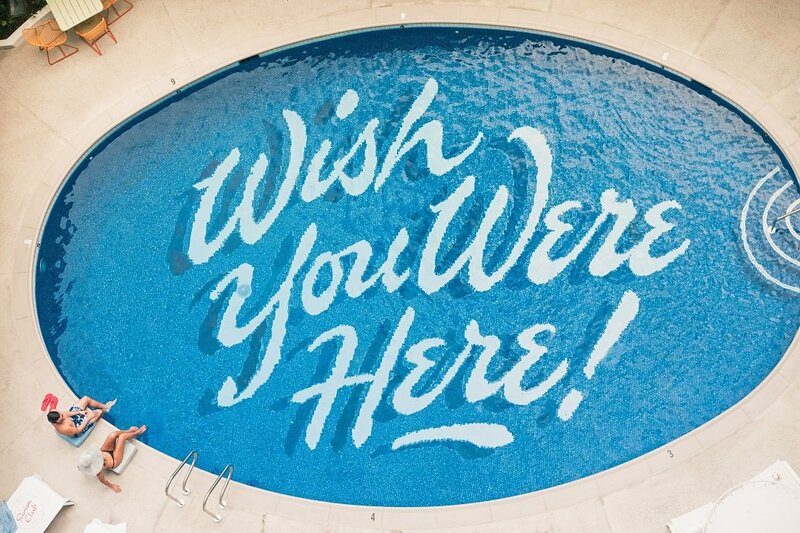 Please ask your travel agent for the best available rate on the day. An Amenity Fee of US$25 plus tax per room per day is payable direct. Maximum two people permitted in a Superior Room with Lanai. 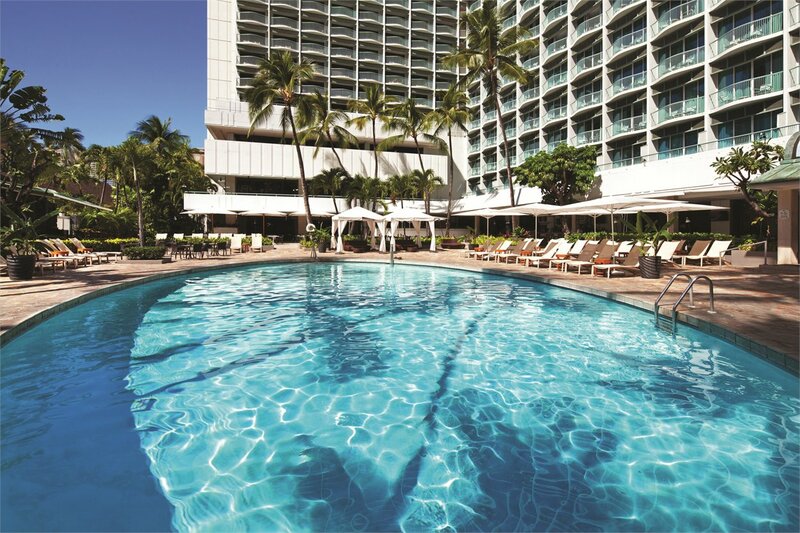 Located in the heart of one of the world's most famous playgrounds, Waikiki, is the Sheraton Princess Kaiulani. 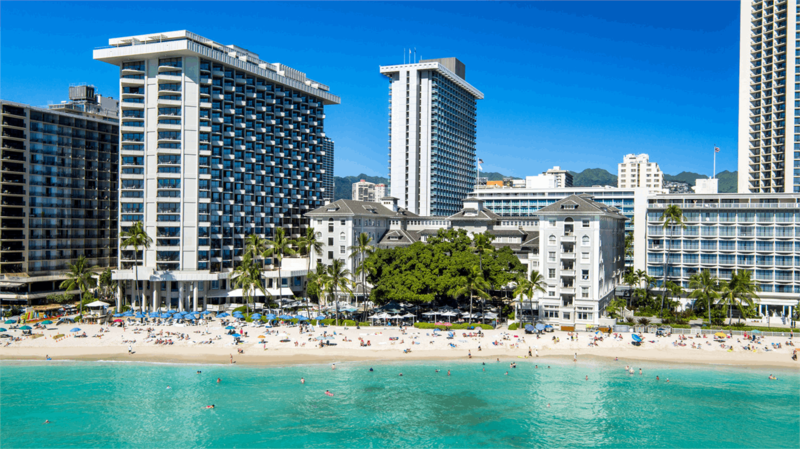 Fronting directly onto Kalakaua Avenue with its variety of world class shopping, and just across the road from sparkling Waikiki Beach, the Sheraton Princess Kaiulani offers guests comfortable accommodation in a relaxed Hawaiian setting. NOTE: From price based on a City Room, Standard rate, for travel on selected dates between 12-30 May 19. A Daily Resort Charge of US$34.55 per room per day is payable direct. With 112 vintage inspired rooms, the Surfjack Hotel & Swim Club is located on Lewers Street and is just a 10 minute walk to Waikiki beach. This boutique hotel features fresh and bright one room bungalows as well as one, two and three bedroom suites for those needing a little extra space. When you're not lounging at the beach or exploring the island, stop and enjoy a cocktail and “talk story” with other guests around the pool at the swim club, or enjoy dinner at Mahina & Sun's restaurant by innovative Chef Ed Kenney. Receive a 5th night FREE, plus extend your stay and receive every 5th night FREE. Conditions apply. NOTE: From price based on a One Room Bungalow, 5th Night FREE rate for travel on selected dates between 19 May - 27 Jun 19. Hotel pricing is dynamic and is subject to availability. Additional accommodation surcharges may apply on selected Thu-Sat nights. Please ask your travel agent for the best available rate on the day. An Amenity Fee of US$26.17 per room per day is payable direct. Discover all that Waikiki has to offer at the popular Hilton Waikiki Beach Hotel. 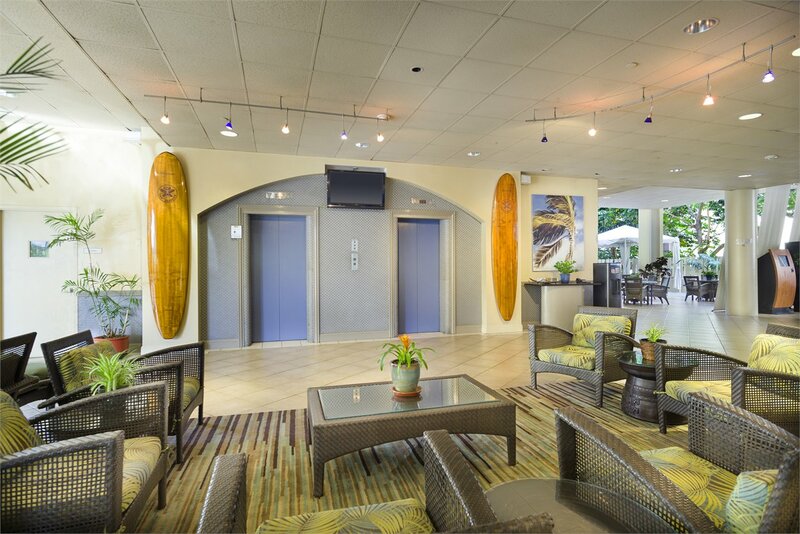 Ideally located just one block from the beach on Kuhio Avenue, with Diamond Head, as a stunning backdrop, this contemporary hotel is a great base from which to explore this Hawaiian paradise. NOTE: From price based on a City View Room, HOT Deal rate for travel on selected dates between 12 May - 22 Jun 19. Discover the chic side of Waikiki at 'Alohilani Resort Waikiki Beach. Located directly across from the sparkling Pacific Ocean on Kalakaua Avenue, 'Alohilani features contemporary design, trendsetting cuisine from Iron Chef Masaharu Morimoto and a lively day-into-night pool scene. Sparking a new vibe on Waikiki Beach, 'Alohilani seamlessly blends Hawaii's cultural heritage with an elegant contemporary style that's uniquely Aloha Chic. Includes one night FREE! Plus extend your stay and receive every 4th night FREE. Conditions apply. NOTE: From price based on an Ocean View Room, 4th Night FREE rate for travel on selected dates between 12 May - 20 Jun 19. A Daily Resort Amenity Fee of US$40 plus tax per room per day is payable direct. Known throughout the world as “The First Lady of Waikiki”, this legendary resort combines turn-of-the-century Victorian elegance with modern Westin amenities and luxury. Located right on Waikiki's stunning beachfront, this is the ideal choice for a luxury getaway. Receive 20% discount off spa treatments at Moana Lani Spa. 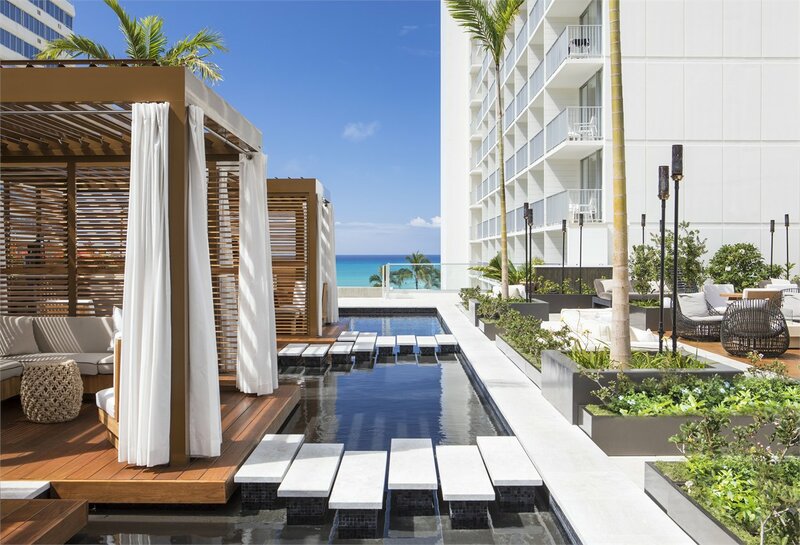 Includes: STAY AT ONE, DINE AT ALL: Guests staying at any one of the four Starwood Hotels in Waikiki can enjoy dining, shows, oceanfront entertainment options, spa treatments, and can simply sign the charges back to their room. Conditions apply. NOTE: From price based on a Historic Banyan Ocean Room, Banyan Bliss rate, for travel on selected dates between 12 May - 15 Jun 19. A Daily Resort Charge of US$38.74 per room per day is payable direct. A maximum of two people permitted in a Historic Banyan Room. showcases spacious guestrooms with breathtaking views; award-winning cuisine and a salt water swimming lagoon. Includes: Return flights from Honolulu to Hawaii Island and 2 night accommodation as specified. 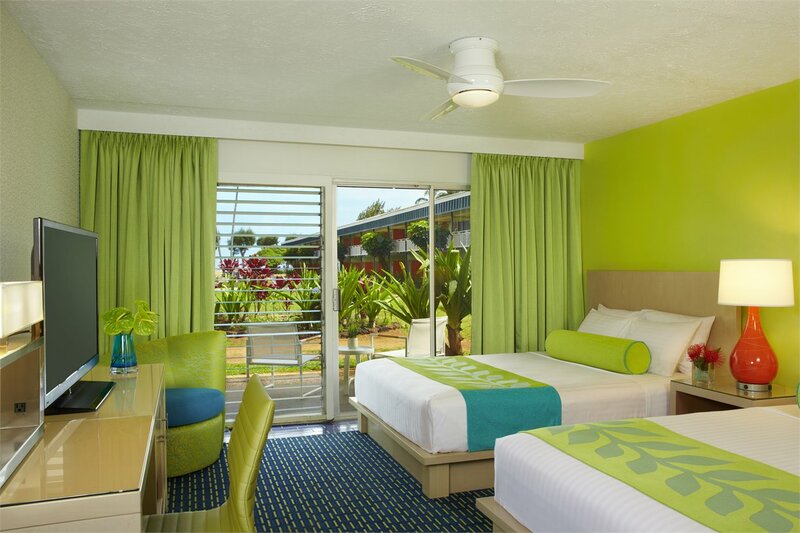 NOTE: From price based on a Standard Room, Aloha rate, for travel on selected dates between 12 May- 27 Jun 19. The Kaua'i Shores is situated on a secluded beach on Kauai's Royal Coconut Coast. The property features six beachfront acres of lush tropical lawns and gardens and two outdoor swimming pools. Contemporary accommodations feature sleek, retro-modern designs and vibrant island colours with private lanais offering beautiful mountain, garden, pool or ocean views. 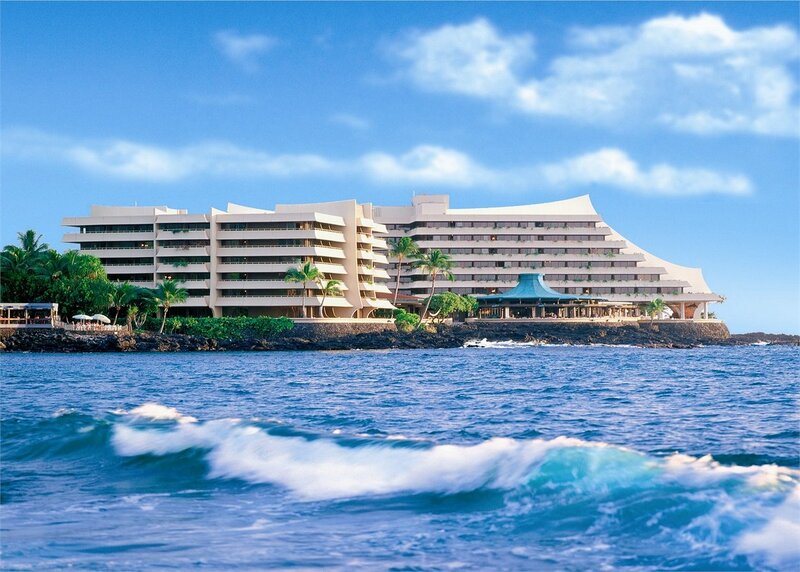 The hotel also features the Lava Lava Beach Club restaurant, the island's only Toes in the Sand dining experience. Includes: Return flights from Honolulu to Kauai and 2 night accommodation as specified. NOTE: From price based on a Garden View Room, Tier C rate, for travel on selected dates between 12-23 May 19 &amp; 29 May - 27 Jun 19. A Hospitality Fee of US$20 plus tax per room per day is payable direct. 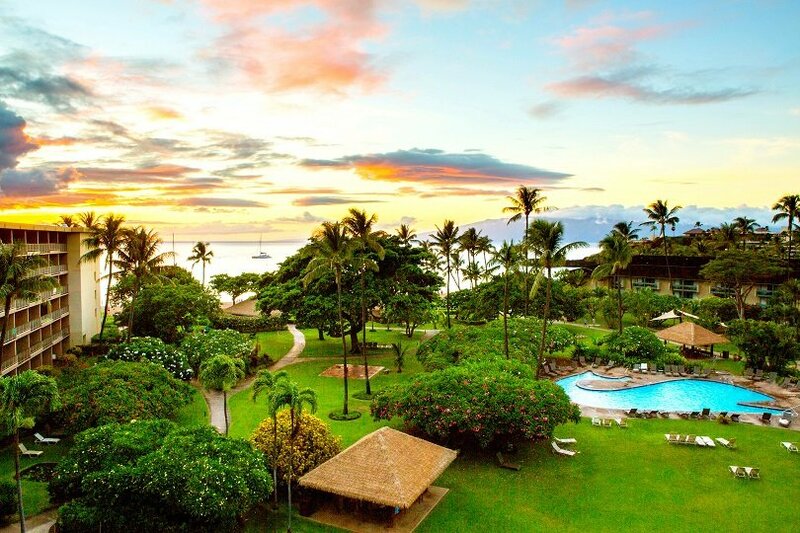 Located right on beautiful Ka'anapali Beach, the popular Ka'anapali Beach Hotel stretches over eleven acres of tropical landscaped gardens and prides itself on its traditional Hawaiian hospitality. The resort offers a range of complimentary activities daily including everything from ukele lessons through to pineapple cutting and hula lessons. For dining options, enjoy local flavours and fresh cuisine at the Tiki Terrace, or sip on a tropical cocktail poolside while the sun goes down at the Tiki Bar. Includes: Return flights from Honolulu to Maui and 2 night accommodation as specified. NOTE: From price based on Garden View Room, Standard rate, for travel on selected dates between 12 May - 23 Jun 19. PACKAGE TERMS & CONDITIONS: It is our policy to present the cost of our holidays inclusive of all airport and government charges. Please accept however that these charges are not within our control, therefore we reserve the right to pass on any increase.. Travel agent professional service fees where charged, will be additional to the advertised prices. Closeout and blackout periods apply over school holidays and peak holiday periods & availability of seats & rooms is likely to be very limited over this time . *Child prices are based on one or two children of 2-11 years sharing a twin room with 2 adults (varies by property and room type). Valid for sales to 15 Feb 2019. Valid for travel commenced and completed within the period 12 May 2019 to 29 Jun 2019 (unless otherwise specified). Min stay: 4 nights / Max stay: 2 months..Prices are ex Auckland. For departures ex Wellington please add $179 per adult and add $139 per child. For departures ex Christchurch please add $179 per adult and add $139 per child. Prices are per person in New Zealand dollars based on payment by cash, cheque or eftpos only. Prices have been based on exchange rates and hotel availability as at 30 Jan 19 and are subject to change and currency fluctuation. Package pricing shown should be used as a guideline only and is based on airfares and best available low season accommodation rates at time of publishing and is subject to additional surcharges and blackouts. Pricing for all other dates are available on request. Payment & ticketing deadline - Ticketing must be completed within 7 days of reservation but no later than 22 Feb 19.. Prices are based on Economy class fares with Hawaiian Airlines for travel ex Auckland. Airfare is combinable with Jetstar (JQ) Add Ons. Add $179 per adult return from WLG/CHC; $236 per adult return from PMR/NPE/NPL; $276 per adult return from NSN/DUD/ZQN. Kids 2-11 years pay 75% of add on cost. Airfare valid for travel: 12 May - 29 Jun. Book HA 'L' Class. If 'L' class is not available, travel is also permitted in 'K' class for an additional $53 per person each way. Book JQ 'I/Z/A' class for domestic travel within NZL. Routing: WLG/CHC- (JQ)-AKL-(HA)-HNL-(HA)-OGG/KOA/LIH and v.v. Travel requiring an overnight stay in Auckland will be at passengers own expense. Neighbour Island add ons: Neighbour Island add-on pricing is valid ex Honolulu and must be booked in conjunction with one of the specified Hawaiian Airlines Honolulu packages only. A maximum of one Neighbour Island add on may be booked at this price. Should more than one Neighbour Island add on be required then additional airfare surcharges will apply. Neighbour Island Add on flights must be booked and ticketed at the same time, in the same booking class as the international fare and on the same ticket as the international sectors. This cannot be added at a later date. Travel must be commenced and completed within the specified travel period. Accommodation: Rate Type & Room Category - Please note hotel costings and bonus offers are based on the rate type and room category as specified for each individual hotel. Should either the specific rate type or room category not be available, then additional surcharges will apply. As inventory and availability for rate types can change on a daily basis, please contact your GO Consultant for the best available price on the day. Dynamic pricing is subject to fluctuation until time of confirmation. Resort Fees: Resort fees and their inclusions are strictly subject to change. Pricing on this flyer should be used as a guideline only. Where accommodation overlaps two seasons a surcharge may be applicable for the nights that fall into higher season. Hawaiian Airlines departs Auckland on selected days of the week only. Due to flight schedules, additional nights may be required over certain dates. Capacity is strictly limited. Fare may not be available on all services or routing options. OSI entry Required at time of PNR creation: HA WHOLESALE FARE Fare Basis: LLHWL6W - 'L' Class (KLHWL6W - 'K' Class) AIRFARES ARE NON REFUNDABLE. Prices shown are based on per person costs in New Zealand Dollars, for payment by cash, cheque or eftpos only. Credit card sales not permitted unless Travel Agent acts as a merchant. Events beyond our control such as currency fluctuations and changes to the price of aviation fuel may result in prices variations . Strict cancellation fees apply. Packages are based on consecutive nights. For split stays please contact your travel consultant. For full terms and conditions and cancellation fees please contact your local travel agent for more information. Trade enquiries via GO Holidays. FLYER CODE: HA30JANHNLGO.